Chichester Canal offers boat trips, refreshments, rowing, fishing, canoeing and walking. Volunteers restore and maintain the canal. two profiles were found for Chichestercanal.org.uk in social networks. Among other social networks the website is represented in Facebook and Twitter. The web server used by Chichestercanal.org.uk is located in Great Britain and run by Kualo Ltd. On this web server 13 other websites are hosted. The language of those websites is mostly english. 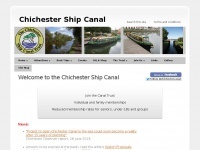 The Chichestercanal.org.uk websites were developed using the programming language PHP and served by a Apache server. For managing the data of the webpages the CMS WordPress is used. The website uses the latest markup standard HTML 5. To analyze the visitors, the websites uses the analysis software Google Analytics. The website prohibits search engines and webcrawlers using the description of the website from the Open Directory project. Other actions by webcrawlers and bots are allowed.